Happy St. Patrick’s Day! In honor of this holiday, we’re celebrating some special birds. Ireland has one bird, in particular, that really boasts this holiday’s colors! 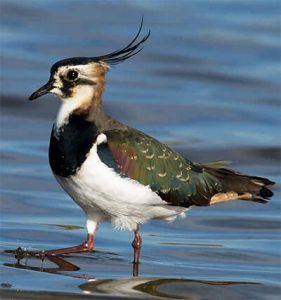 The Northern Lapwing is not Ireland’s official bird, but by bird enthusiasts, it’s certainly an Ireland favorite. The Northern Lapwing is also referred to as the “Green Plover” with is rounded wings, striking colors that resemble Ireland’s green, white, and orange colors, and it’s black crest. The Northern Lapwing gets its name from the lapping sound of their wings in flight and the way that they avoid and scare away predators from their homes. The bird simply trails its wing behind as if it is injured. In addition to its striking colors and unique defense mechanisms, the Northern Lapwing has a steadfast alarm call that wards away any unwanted intruders! Unlike Ireland’s home foods of potatoes and corn beef, this bird prefers to eat insects and other small invertebrates at night. 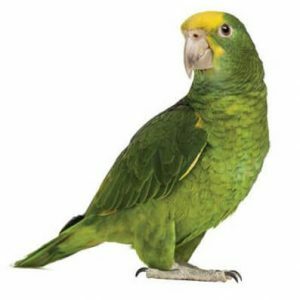 There are a few other birds that exhibit this National Holiday’s proud green colors. More green birds? Absolutely! Male Eclectus birds are very different from their female counterparts, that at one time Ornithologists believed they were of two different species! 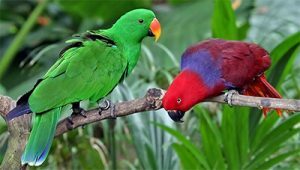 Male Eclectus are dominantly green, while the females are red. It’s as if the females represent the holiday of Valentine’s Day and the Males, St. Patricks!